Conventions are our bread and butter. These gatherings of geeks allow us to not only game and experience things that might pass us by a home, but also allow us to meet and greet an amazing variety of gaming personalities who all share in a similar passion. BGGCon is an amazing thing – a con dedicated solely to those of us who pepper our lives with board games and wish to share that experience with others. It’s a unique venue, and we’re here to share our experiences with all of you, Dear Listeners. Your wish is my command. Rattlebones is now available at online retailers like Coolstuff and Funagain. Thanks for the kind words. Glad you had fun with the monkey wizards and mice familiars. Here’s a fun little secret: I have no idea what that’s all about. That’s the artists’ interpretation. The game I submitted had standard pawns for movement and scoring. Great podcast. I’m now a regular listener. Stephanie, oddly enough I wound up buying that copy of Imperial at the flea market you described. I’d been introduced to it only a week earlier and really liked it. I also commented in passing to you on your pick up of Sails to India. How are you liking that game? Chris, Spyfall had your name written all over it. I knew you’d like it. I wish we’d found time to play it together at the convention. Next year we really owe it to one another to play games together. Your step dad’s health will be in my prayers. Please take this next bit as a gentle criticism. It’s just that as a LONG time listener I’d rather see the length come back around the 2 hour mark. Yeah, I know it hasn’t been close to that in several episodes, but please consider it. When you joke 2 hours into the podcast about nobody still listening, there may be a grain of truth to that humor. I feel that many of the conversations could use some tightening up to allow the show to flow more smoothly. Take that for what it’s worth, but know I do enjoy hearing from all those presently voicing their opinions on the show. So, I’m not looking to vote anyone off the island. Lee, thank you for your feedback! It is greatly appreciated, and I agree about the length. We have talked over a few ideas on how to keep it shorter, so we will try a few of those out. It’s hard when we have so much to talk about. Hopefully, it’s still unique and interesting. Keep listening! I haven’t gotten to play Sail to India yet, but I saw it played at Origins by people whose game opinion I trust, so I look forward to getting it to the table after Thanksgiving. In Fury of Dracula, only the X side of the die prevents you from moving at all. If you roll a 0 you can’t move by train but can still move by road or by sea that turn. So you only have a 1/6 chance of being unable to move, and being stuck for 6 turns would be insanely unlucky. Regarding Rattlebones… We were playing that in Dallas, neat mechanism to replace the sides and customize the dice. We were playing incorrectly at first, and it sounds like you did the same thing: We thought it was super lame whenever someone rolled a Rattlebones, they basically lost their turn. It was so lame in fact that I looked in the rulebook and found that in fact, in addition to moving Rattlebones, you also get to move a monkey 1 space. I also found that Gold appeared to be useless. If you replace a side with gold, then later you get 1 gold when you roll it (in lieu of anything else), and the only think to use that gold for seemed to be rolling a 2nd die on your turn. I could not see any reason not to use it immediately on the next turn, and I could not see how that was ever better than any other thing. The re-roll die seemed MUCH better, allowing you to reroll that die as well as another die every time it comes up. I feel like the Gold die needs to give you 2 gold in order to really DO anything. Todd, thanks for the info. My friend, Chris, pointed that out to me, as well. However, I rolled the x 3 times, the 0 once, got my turn ended (and lost all my items) by a Dracula event when I tried to cross borders, and then landed on an encounter that ended my turn. But, I’m perfectly fine with that. It just wasn’t the deduction game I was expecting. Now that I know how the game is, I’m not setting myself up to be disappointed. I’d play again because I love the theme, and I want to bring honor back to my family by defeating that damn train die. I agree with you on Rattlebones, Seth. Although, I was perfectly fine not moving when we rolled Rattlenones. I got to move Rattlebones!! There were landing spaces that I felt like were better than others. I basically built a reroll/points engine. I had one die upgraded to the 5 point pip with all sides surrounding having the arrow point to it (we never knew if there was a limit to which faces you could add, and we didn’t care), then I made a reroll die in the same manner. Then my last die was a X2 and pip movement. I would roll the reroll first so I could then roll that and my points then reroll all three to hopefully double my points. 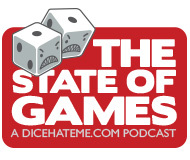 Great to be hearing your opinions about the games you played at bggcon. 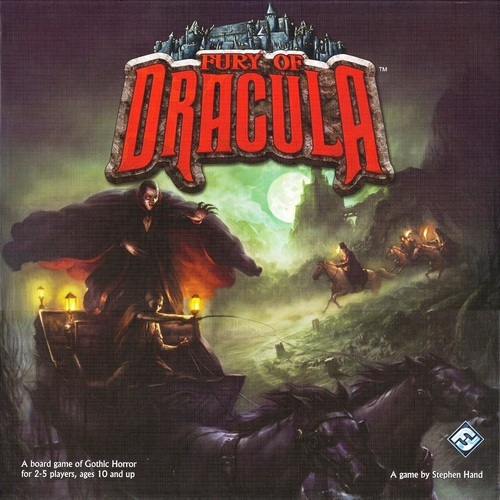 Also some older games, like Fury of Dracula, was interesting for me to hear about because I never met anyone who played it before (considering the price tag not much of a surprise unfortunately). I’m awfully excited about Mysterium now.. I keep hearing so many good things about it and the fact that it’s language independent sounds like an added bonus. Black Fleet has my interest now as wel..